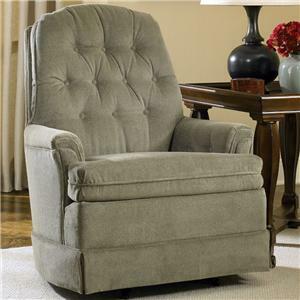 This classic traditional upholstered rocking chair, with its button tufted back and inside arms, can be brought into any room and feel natural. With many fabric choices you can get the look that is right for your living room, family room or den. This chair not only looks good, but with its high resilient foam seats and padded back, it will become a favorite resting spot. The 1002 Upholstered Rocking Accent Chair by Charles Schneider is available in the area from BigFurnitureWebsite. Arm A small rolled arm, button tufted inside and multi-layered face. Leg or Skirt Full tailored and lined skirted with surged and glued edges.